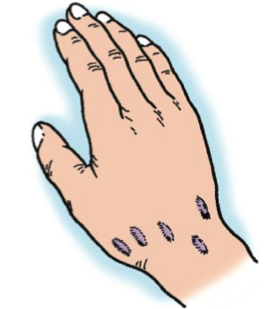 Ganglion Cyst Handout | Dr. Thomas Trumble, M.D. Ganglion is a Latin word for a knot or a bump. The term ganglion is actually used for different parts of the anatomy, but the part that pertains to this is a cyst that occurs typically around the wrist, but can also occur around the fingers. These are fluid filled cysts that stem from a proliferation of tissue that lines the joint called synovium. The ganglion for the wrist typically occurs on the back or dorsum of the wrist (Figure 1). They can also occur on the palms of the wrist in which case they tend to be intimately involved with the radial artery (Figure 2). The cysts are often painless, but some patients do experience pain during heavy activities. The cyst can get large enough that they actually block wrist motion. The ganglions typically occur from a joint near the scaphoid. 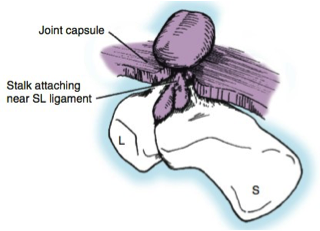 The scaphoid has one of the largest arcs of rotation and it is possible that this gives rise to increased proliferation of the lining tissue called synovium. The ganglion typically has a stalk and then arises as a bubble or balloon shaped lesion (Figure 3 and 4). This often happens in healthy young patients. Women are more likely than men to have a ganglion cyst due to their joint laxity. When a ganglion is suspected in someone who also has a history of arthritis, it is very important to rule out arthritis as the cause of the joint swelling rather than a ganglion cyst. Often these cysts can be diagnosed clinically by noticing a round fairly firm mass that can still be soft enough to compress it. X-rays are helpful in making sure that the cyst does not involve an area of arthritis or other abnormality in the wrist joint. Occasionally, an MRI can be helpful. In this case, the cyst usually lights up as a bright round lesion close to joint line (Figure 5). Ganglions that are small, painless and that have been present for years can be simply observed. Ganglions that are larger, that have grown rapidly or that are becoming painful and block motion should be treated. 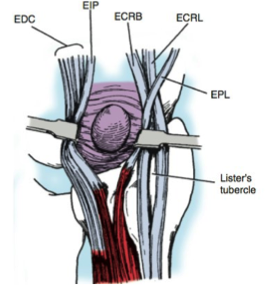 We recommend for the dorsal ganglion an aspiration to draw the fluid out and then to inject a small amount of corticosteroid at the base of it to try to seal off the stalk that contributes to the ganglion. 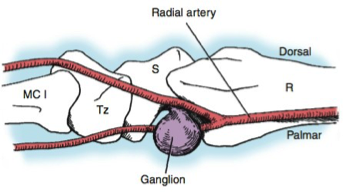 We do not recommend aspirating the volar ganglions because the ganglion is so close to the radial artery that a perforation of the artery can occur. Please refer back to that figure which is 26-4. For dorsal ganglions that recur despite an injection or for volar ganglions that are symptomatic, we recommend surgical removal. This is done as an outpatient and requires a small incision so that the ganglion can be dissected free of the tendons, have the stalk traced out and then excised. It is important to remove the stalk to prevent them from recurring. Concerns following ganglion surgery are residual wrist stiffness, so wrist therapy is often prescribed for stretching exercises after surgery. The sutures are removed at 10 days and therapy program is usually started at that point. We typically recommend having a splint for about five days after the surgery to prevent joint motion, allowing the wrist to heal and prevent excess swelling that can cause ganglion reoccurrence. The patients typically regain all their motion and strength following the ganglion excision. The scars continue to fade over the next three to six months and resulting in an incision that has a good overall appearance.